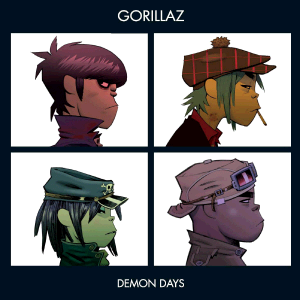 The Number One Album in the UK on the 31st May 2005 was Demon Days from Gorillaz. This British visual & musical project created by Damon Albarn (Blur) and Jamie Hewlett a comic book artist and designer known for being the co-creator of the comic Tank Girl. Their 2001 debut album Gorillaz sold over seven million copies worldwide. Demon Days was recorded between January – December 2004 at Studio 13 in London with production coming from Gorillaz, Jason Cox, James Dring and Danger Mouse. Danger Mouse – Brian Burton – an American musician, producer and songwriter who formed Gnarls Barkley with Cee Lo Green; and produced Modern Guilt from Beck & Attack & Release from The Black Keys. “‘Demon Days’ may end 2005 as one of the year’s most celebrated albums. Before you even consider the sonic and melodic innovation paraded through the album there’s so much crammed into each of these fifteen songs (without any one of them sounding overproduced or cluttered) that repeated listening is a must. With ‘Demon Days’, repeated listening is like throwing a dolphin a fire escape – entertaining the first time, impossible to predict the outcome on each subsequent attempt. There’s always something new to enjoy. Demon Days was a huge success internationally building on the success of their debut album. The combined sales of the Gorillaz and Demon Days albums have exceeded 15 million copies. All tracks produced by Danger Mouse and Gorillaz. Co-produced by James Dring and Jason Cox except “68 State”, “People”, “The Swagga” and “We Are Happy Landfill” produced by Gorillaz, James Dring and Jason Cox. The album was recorded at the Gorillaz’ own studio and mixed at The Pierce Rooms. “All Alone”‘s instrumental was also partially recorded in Africa. 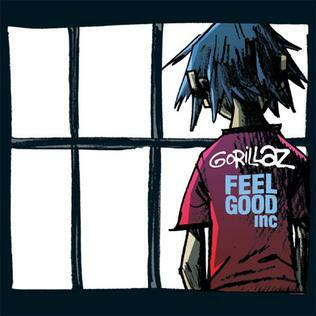 Feel Good Inc featuring De La Soul was a single from the Gorillaz Demon Days album. It was released in May 2005. 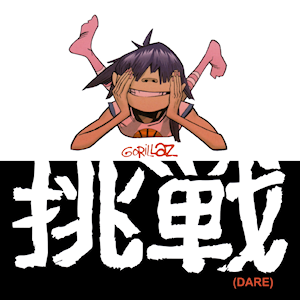 Dare was a single from the Gorillaz album Demon Days. It was released in August 2005. 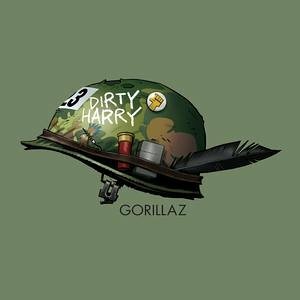 Dirty Harry was a single from the Gorillaz album Demon Days. The Number One album in the UK & Australia on the 30th May was from the Eurythmics, a British music duo consisting of David A. Stewart and Annie Lennox, with their Greatest Hits release. Eurythmics have had two active components of their career – originally forming in 1980 then disbanding in 1990; reuniting again in 1999 and splitting in 2005. Their work rate of Lennox and Stewart over an extended number of years was incredible, which saw the release around an album every 12 months. The 1991 retrospective compilation album – Greatest Hits – was an impressive body of work containing their successful singles encompassing the period between 1982 and 1990 [track listing below]. The album was an enormous success. 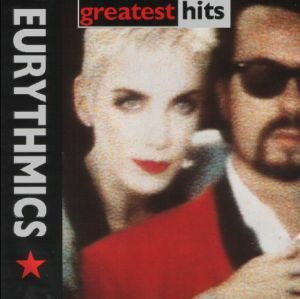 Greatest Hits became the Eurythmics best-selling album worldwide topping the charts in the UK for a total of 10 weeks and in Australia for 7 weeks. In the Garden – their debut album in 1981 – co-produced with Krautrock producer Conny Plank (who worked with Hunters & Collectors – The Fireman’s Curse) with numerous guest musicians such as Clem Burke from Blondie. 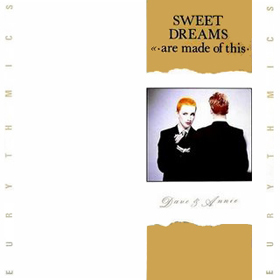 Sweet Dreams (Are Made of This) – their second album released January 1983 was the Eurythmics commercial breakthrough with the title track hitting Number 1 in the States and was a hit around the world. It also included tracks such as Love Is a Stranger and a cover of the Sam & Dave hit Wrap It Up (1968) which was performed as a duet between Green Gartside of Scritti Politti and Annie Lennox. Touch – released in November 1983 – their third album became Eurythmics first no.1 album in the UK and included three major hit singles – the calypso-flavoured upbeat Right by Your Side, the ballad Here Comes The Rain Again with orchestrations by Michael Kamen (who has worked with artists such as Pink Floyd, Queen, Coldplay and Kate Bush) and Who’s That Girl? Be Yourself Tonight – the fourth studio album released in May 1985 included a number of marquee artists such as Elvis Costello, Aretha Franklin and Stevie Wonder making guest appearances. A number of hit singles were released including Would I Lie to You?, There Must Be an Angel (Playing with My Heart), Sisters Are Doin’ It for Themselves & It’s Alright (Baby’s Coming Back). Revenge – the fifth studio album released in July 1986. The new wave / pop rock release included the singles When Tomorrow Comes, Thorn in My Side, The Miracle of Love & Missionary Man. Savage – the sixth studio album by Eurythmics was released in November 1987. The record included the singles Beethoven (I Love to Listen To), Shame, I Need a Man & You Have Placed a Chill in My Heart. We Too Are One – the seventh studio album was released in September 1989 and was Eurythmics last studio release until Peace (1999). The singles include Revival, Don’t Ask Me Why, The King and Queen of America, Angel & (My My) Baby’s Gonna Cry. All songs written and composed by Annie Lennox and David A. Stewart, except “When Tomorrow Comes” co-written by Patrick Seymour.